Stem apical meristems, rhizome apical meristems and rhizome axillary meristems excised from Alstroemeria plants were grown in vitro on modified Murashige and Skoog (MS) media containing different concentrations of gibberellic acid and 6-benzylaminopurine (BA). Plantlets developed from stem apical meristems never regenerated a rhizome and eventually died. 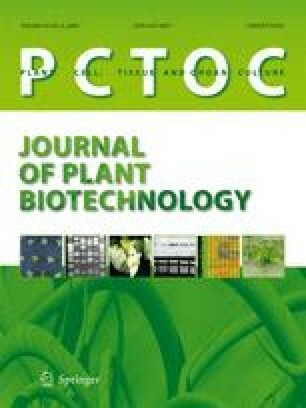 The highest regeneration rate (74.1%) of plantlets with a rhizome was observed when rhizome axillary meristems were grown on modified MS medium containing μM 8.9 of BA. Alstroemeria mosaic potyvirus (AlMV) could be eradicated from infected Alstroemeria plants through meristem culture. The rate of virus eradication was 73.7 and 14.7% for plantlets developing from explants measuring 0.7 mm and 2.0 mm, respectively. Greenhouse evaluation of virus-negative and AlMV-infected Alstroemeria plants showed that healthy plants produced more floral stems, more vegetative stems, longer floral stems and gave a higher fresh weight than infected plants. 1.Department of Plant Science U-67University of ConnecticutStorrsU.S.A.